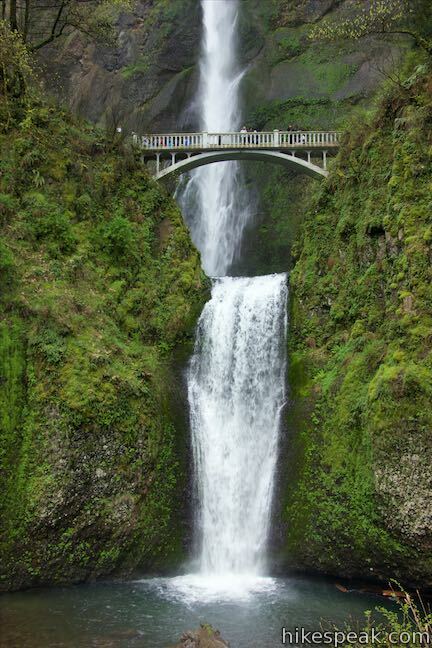 Multnomah Falls is the tallest waterfall in Oregon and one of the tallest year-round waterfalls in the United States. 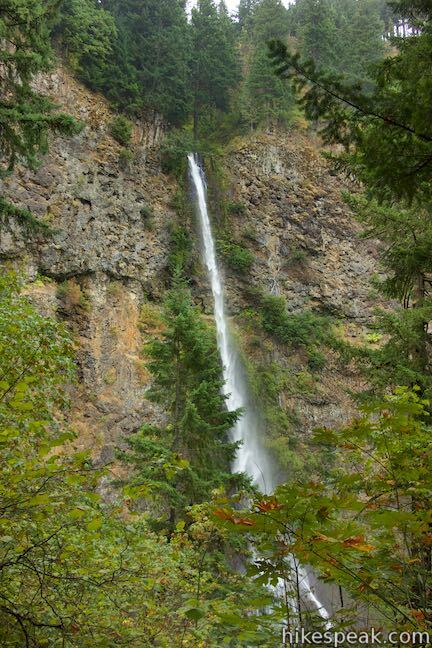 The 620-foot waterfall is grand, beautiful, and easy to reach, making it one of the most popular outdoor attractions in the Pacific Northwest. 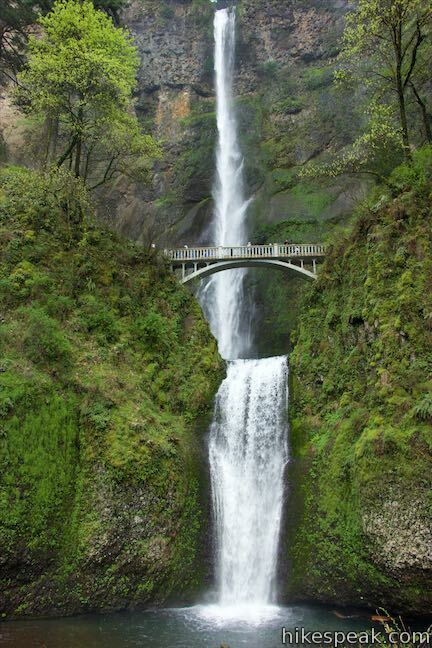 Located in the Columbia River Gorge on the Washington – Oregon border, 30 miles east of Portland, Multnomah Falls offers something for hikers of all abilities. 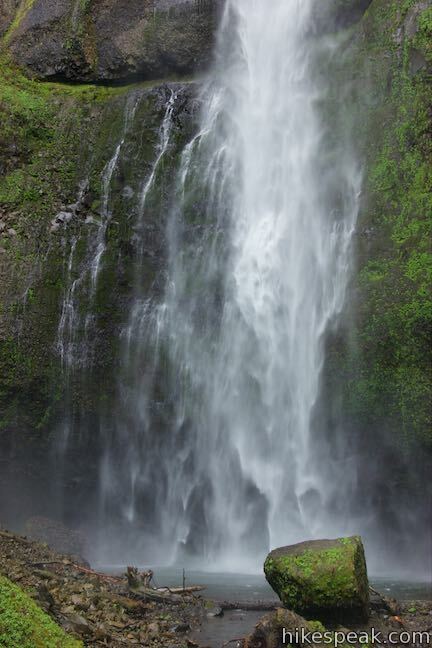 Whether you walk to the base of the falls, hike 0.2 miles to a scenic footbridge, 1.2 miles to the top of the falls, or explore more waterfalls in the area on Multnomah-Wahkeena Loop, your visit will be memorable. 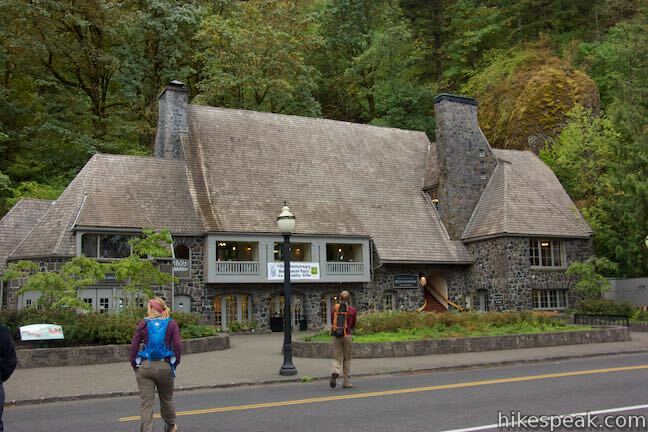 Begin from a parking area just off Interstate 84 and follow a walkway alongside a calm stretch of Multnomah Creek to Multnomah Lodge, a historic stone building with a restaurant, cafe, gift shop, and visitor center – all the things you would expect in a heavily touristed area. 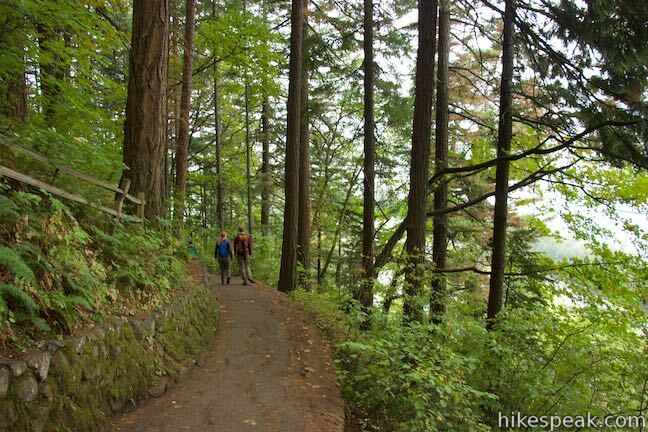 Continue up the walkway to the left of the lodge toward the waterfall itself, which resides in a lush canyon shaded by firs, cedars, maples, and alders. 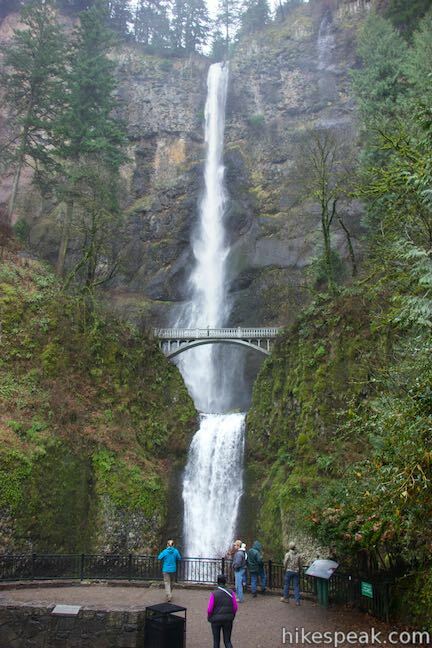 Multnomah Falls is split in two tiers. The upper tier is 542 feet tall, while the lower tier drops another 69 feet. 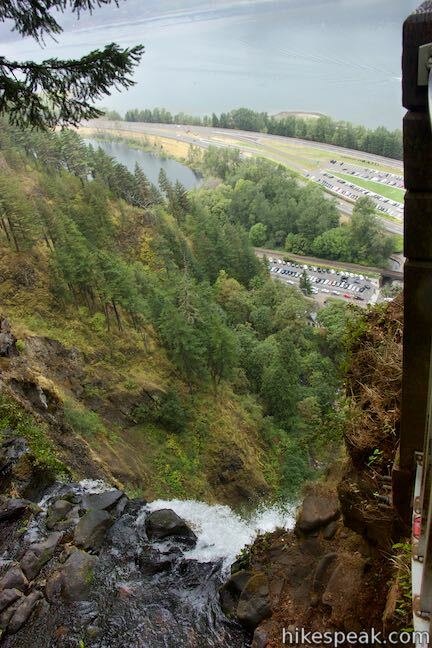 The lower tier makes a swift plunge into a pool in front of the viewpoint. 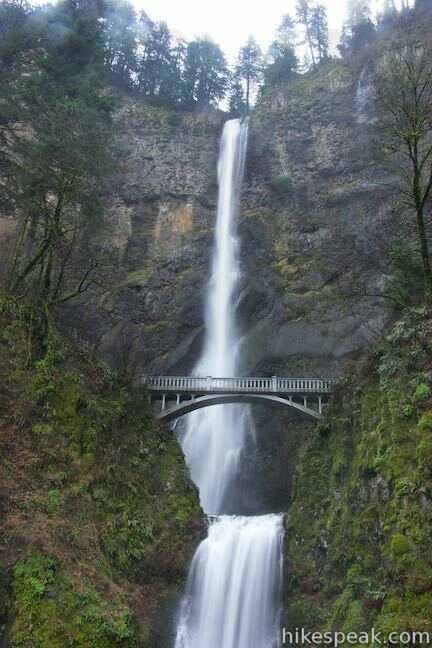 A picturesque footbridge straddles the two tiers, providing an intimate experience amidst the waterfall. 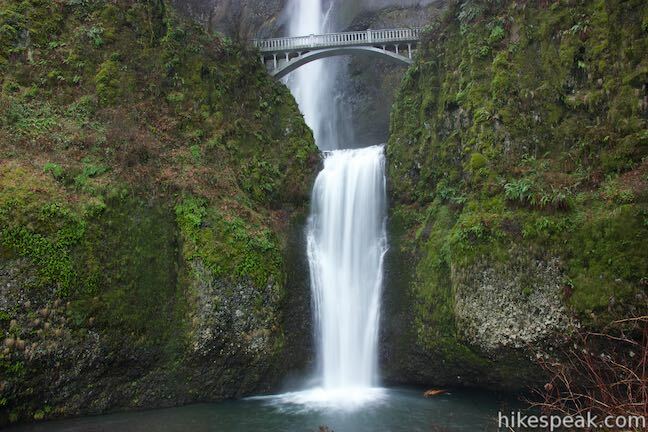 The bridge is designed elegantly enough not to detract from the waterfall’s beauty. Behind the bridge, the upper tier makes a long, long drop down a sheer rock wall with many interesting layers. 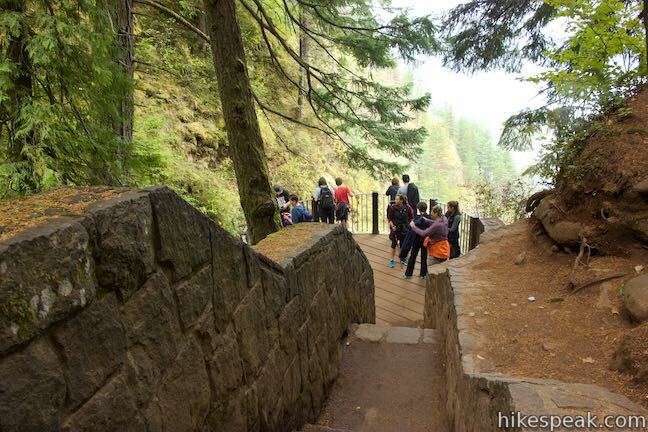 Next to the viewing area below Multnomah Falls, Larch Mountain Trail begins with a short staircase. 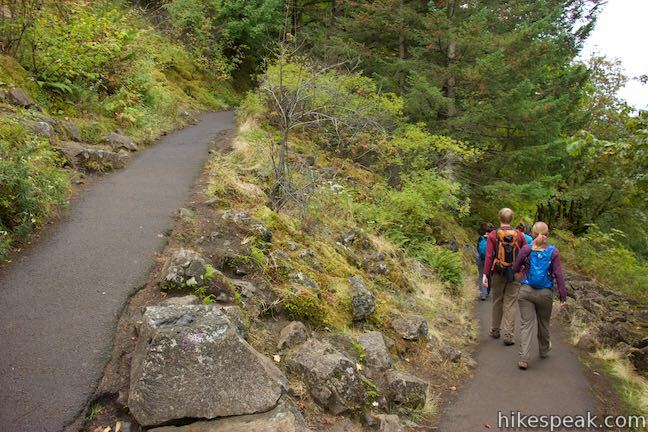 To reach Benson Bridge, continue up this paved trail through a few switchbacks. 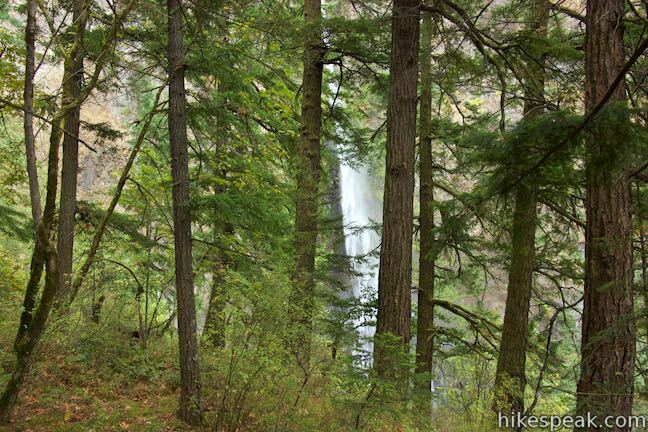 Views of the waterfall become obscured by the forest, but you’ll catch some nice profiles of the lower falls. 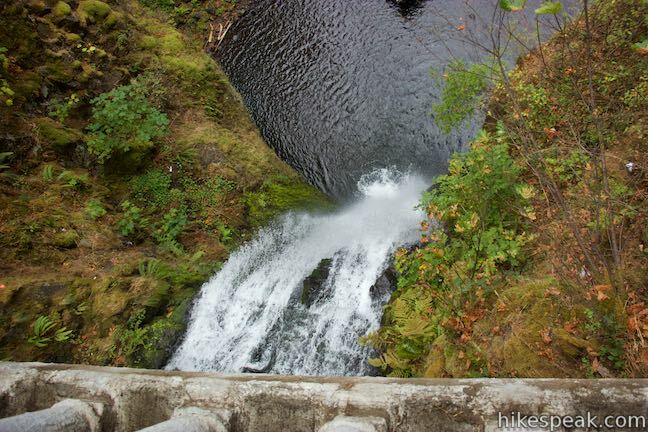 In less than 0.2 miles, arrive at the short but memorable bridge spanning a gap in the canyon on top of the lower tier. 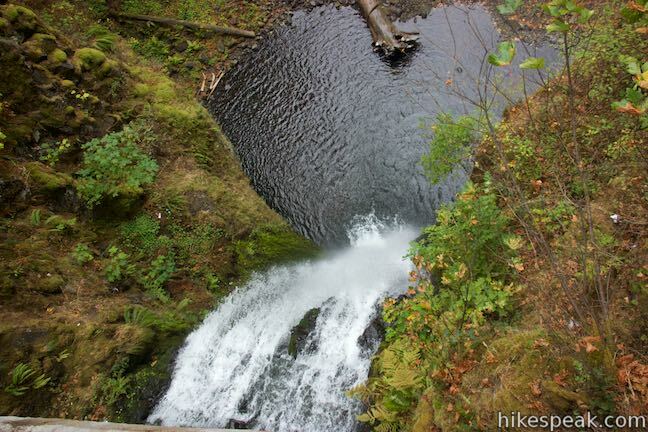 Look over the railing for a dizzying perspective straight down the lower falls. Below that, you’ll see people looking up from the lower viewpoint where you just stood. 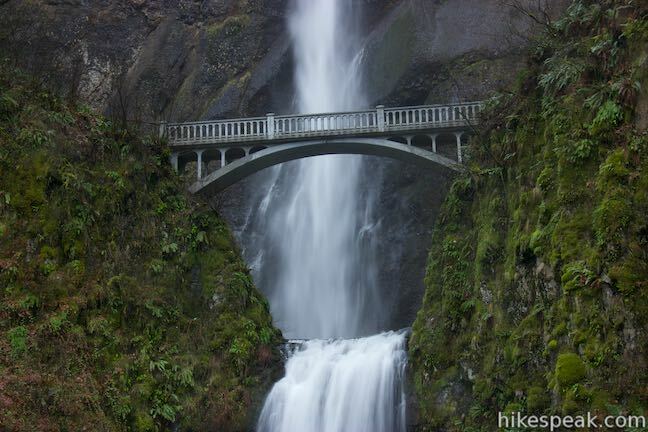 Looking in the other direction, the bridge boasts a better perspective of the upper tier of Multnomah Falls than you had below. 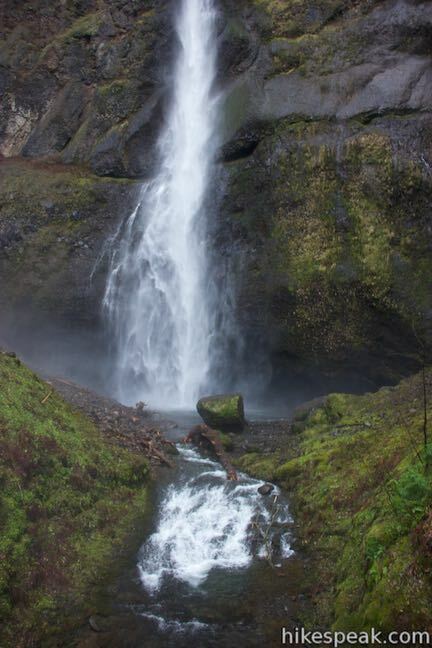 A widening cord of white water falls down an enormous cliff. 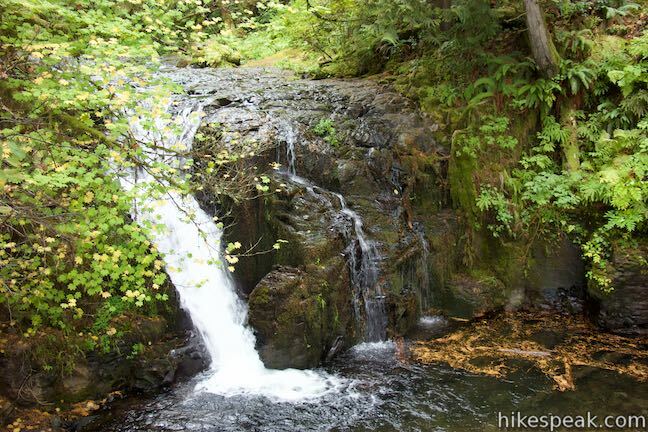 Tilt your head up to see the top of the waterfall, where the creek pours out of the forest above. 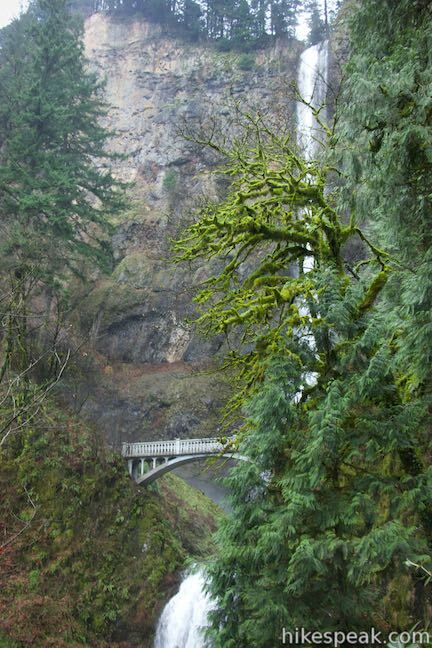 Moss and ferns line the vertical rock wall, adding Oregon charm to this must-see waterfall in the Columbia River Gorge. 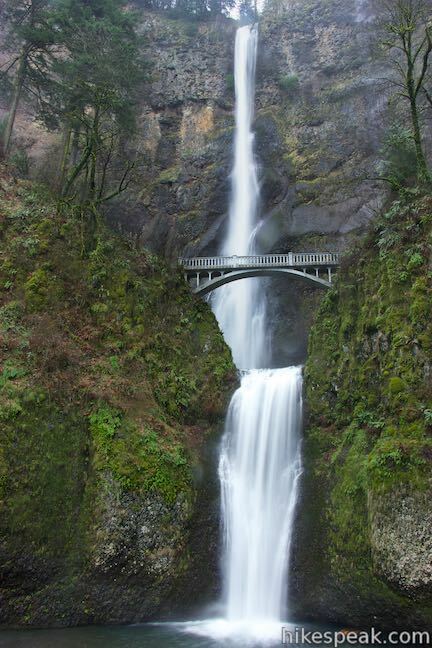 About Benson Bridge: The bridge is named after Simon Benson, a lumberman and philanthropist who donated land along the Columbia River Gorge for preservation, including the land around Multnomah Falls. 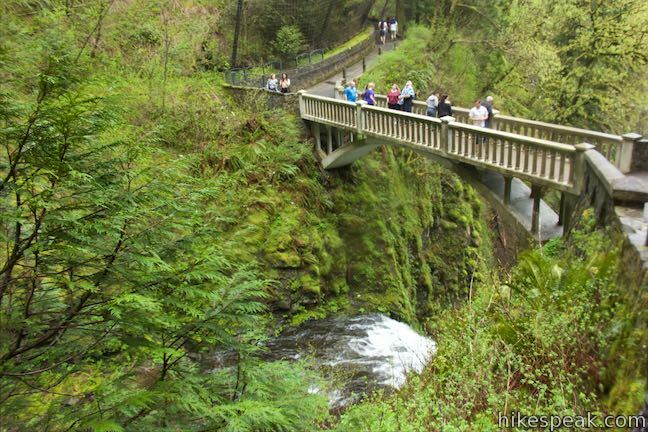 If you intend to turn around at Benson Bridge, don’t do so before crossing the bridge and hiking a short way farther up to a viewpoint at a sharp bend in the trail. 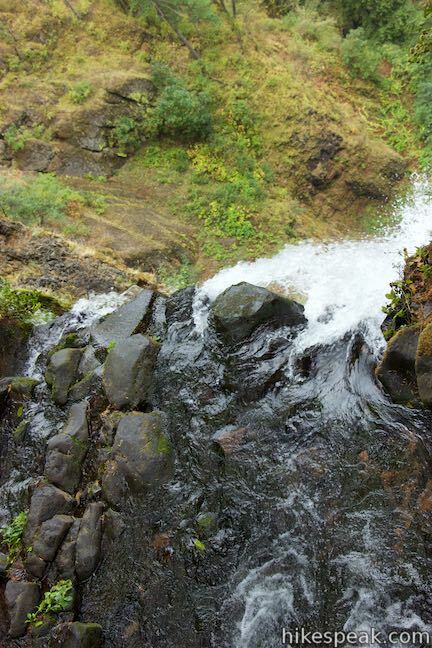 This spot is even closer to the waterfall, hitting hikers with spray when gusts come toward the trail. Watch as water is swept away from the rock at the bottom of this enormous drop. 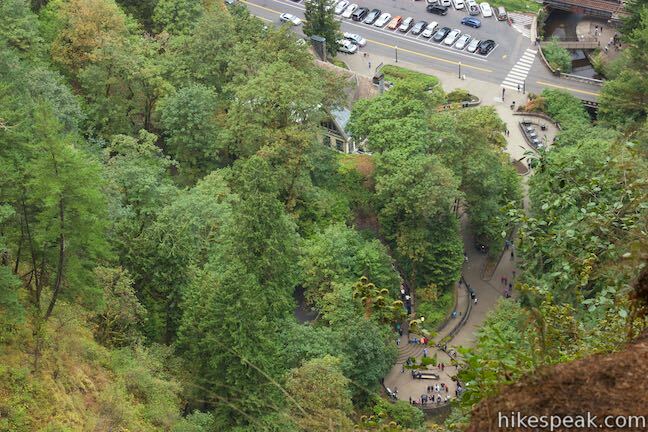 If you hike higher than this bend, recognize that the best views of Multnomah Falls are behind you. 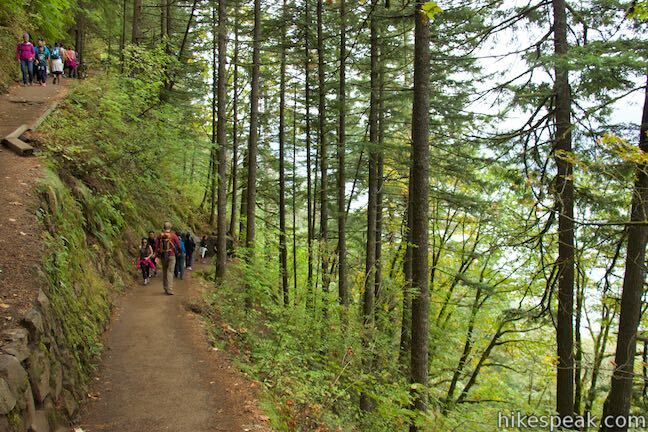 Larch Mountain Trail continues beyond the bend above Benson Bridge and becomes more serious, with eleven numbered switchbacks on the trail up to an overlook at the brink of Multnomah Falls. 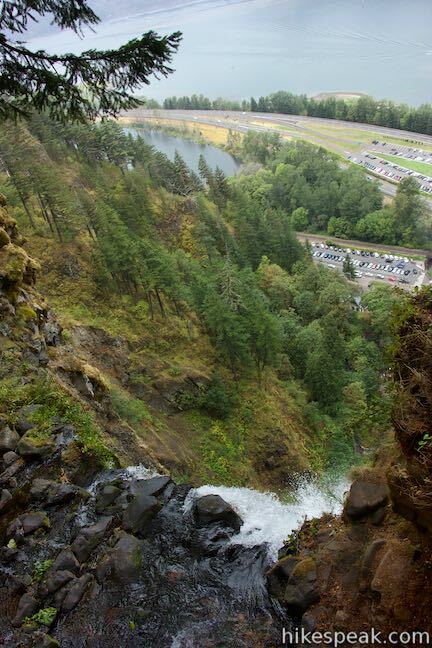 After all that effort, the view from the top of the falls won’t wow quite as much as the ones below, so there’s no shame it turning around at Benson Bridge or just above it. 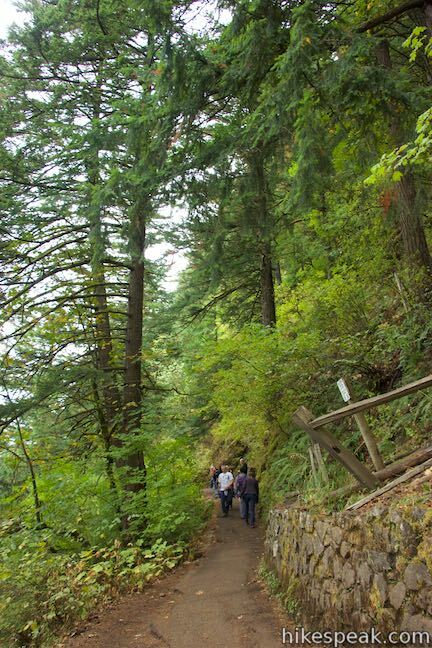 Larch Mountain Trail remains paved as it ascends the side of Columbia River Gorge toward Multnoma Falls. 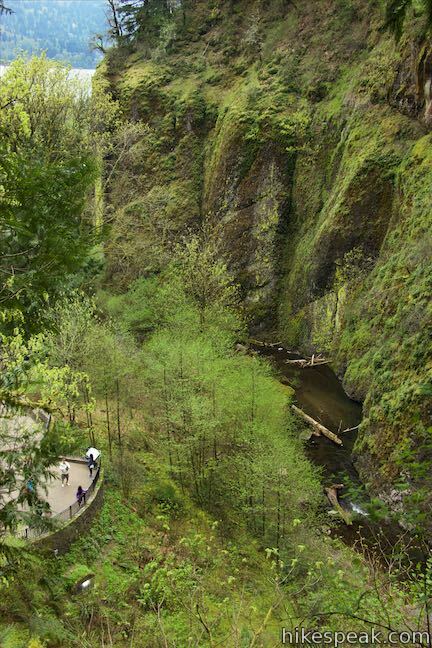 At 0.2 miles above Benson Bridge, pass through a junction with Gorge Trail, which heads east toward Oneonta Gorge. 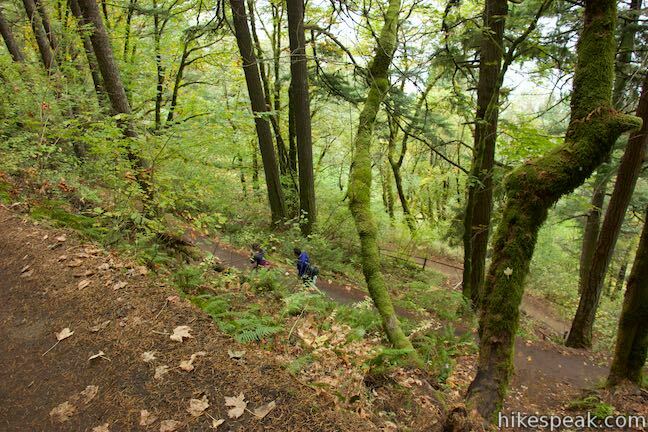 At the next switchback (#3) you’ll find a viewing area with between-the-trees views of Multnomah Falls. Break here or continue up the trail. 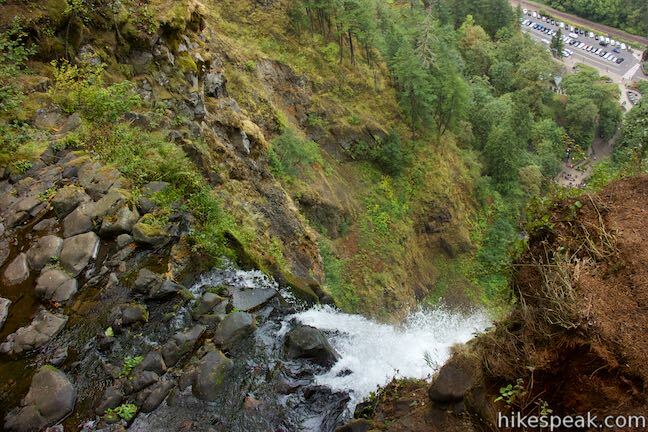 Spot the waterfall again after switchback five before Multnoma Falls goes into hikding. 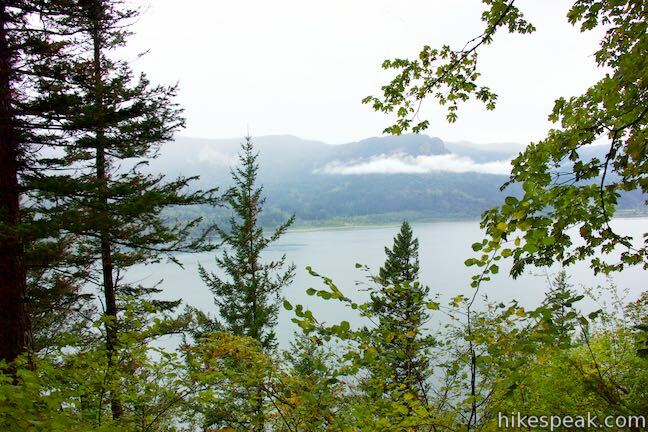 Look out over the Columbia River through gaps in the forest as the trail continues to ascend. Pass through switchback after switchback as the numbers keep going up. 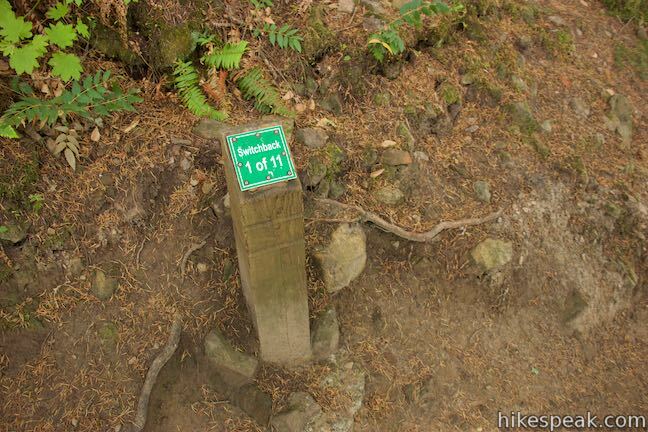 Finally, at switchback number nine, reach a crest in the trail. Ascended 700 feet from the bottom of the trail in under a mile takes effort, so catch your breath as the trail now heads downhill. 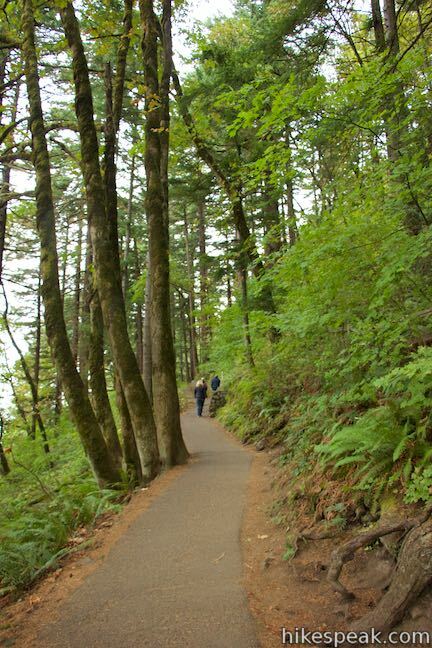 Come to a junction with a trail to Multnomah Falls Overlook. 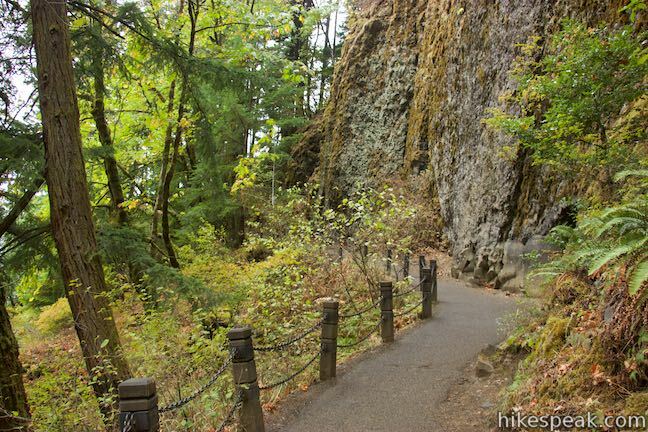 Turn right to hike down the 0.2-mile long spur out to the brink of Multnomah Falls. 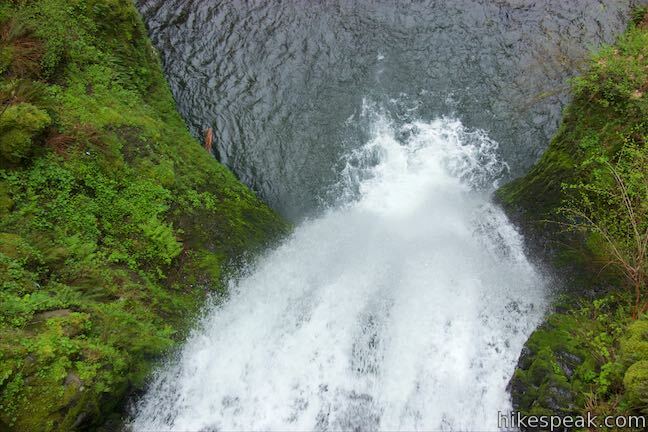 Switchbacks bring you down alongside Multnomah Creek, where the tentative water seems to have no idea what’s in store. 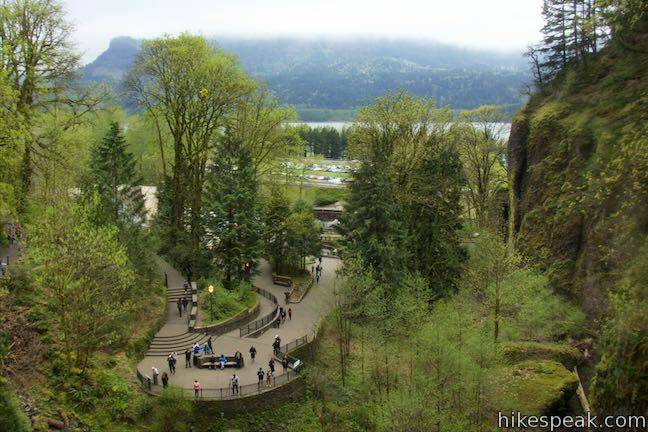 A narrow staircase between stone walls leads to a small round viewing area (with a highly necessary safety railing) that is right alongside the top of Multnomah Falls. 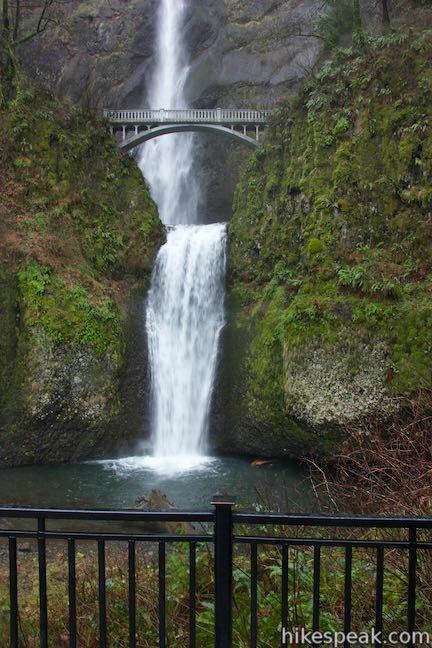 Look over the lip of the waterfall, where the the creek takes a massive 542-foot leap down the upper tier of Multnomah Falls. It’s a long way down. 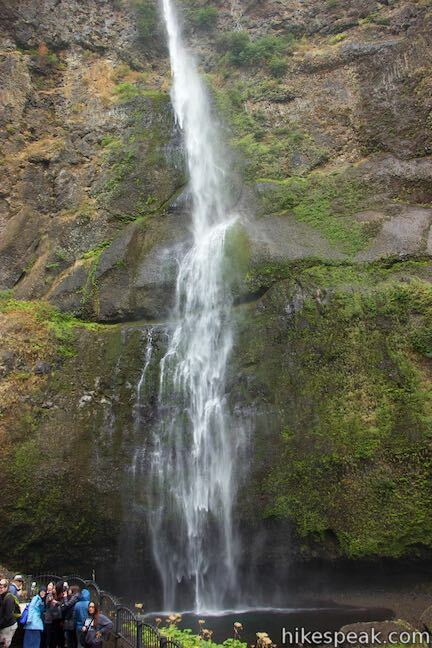 At the bottom of the waterfall, you’ll see the viewing area near Multnomah Lodge. 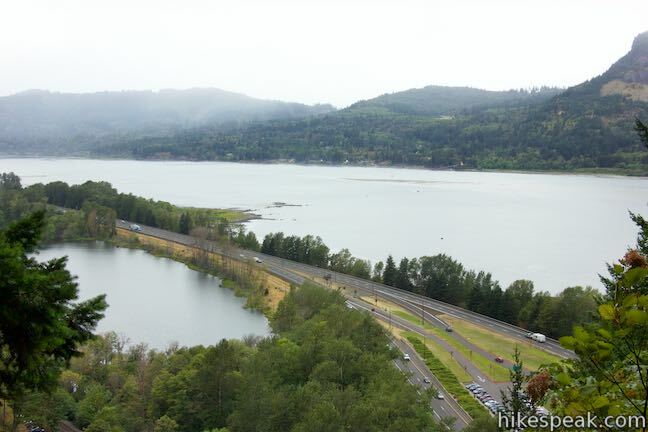 You can also look out past Interstate 84 across the Columbia River Gorge. The overlook allows you to safely stand where it would otherwise be perilous. 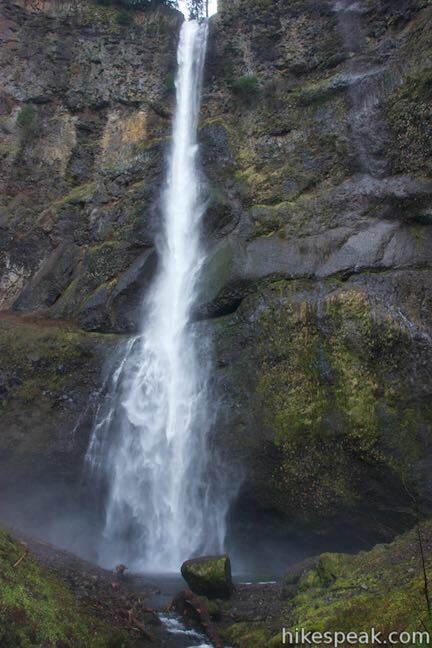 The viewpoint is well integrated into the landscape so that it is not noticeable when looking up at the waterfall from below. 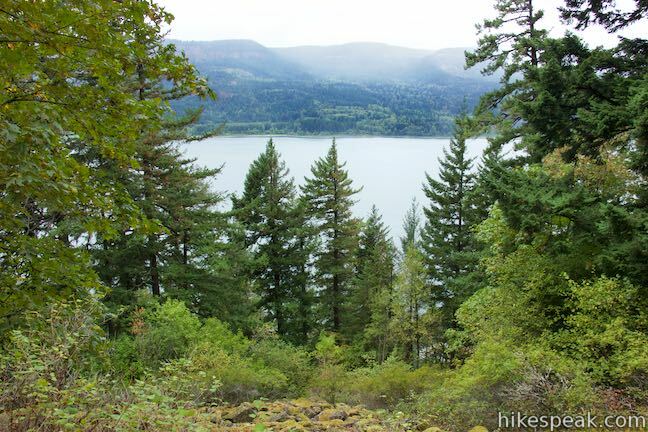 After bagging this top-down view, return to Larch Mountain Trail. 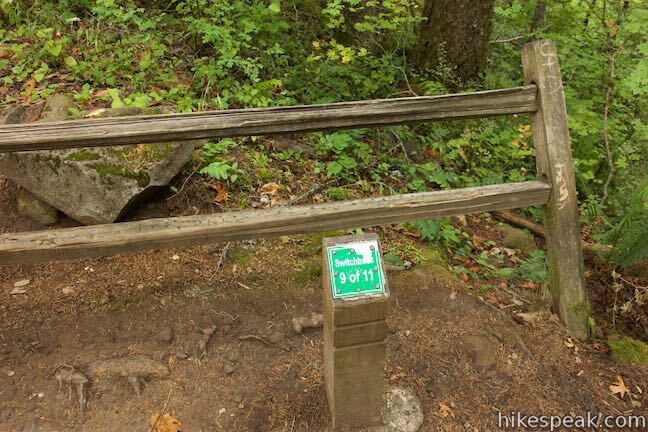 You ca turn left to hike right back down the trail the way you came and complete a 2.4-mile round trip hike. Those eager to see more will find plenty more to see. Turn right up Larch Mountain Trail. 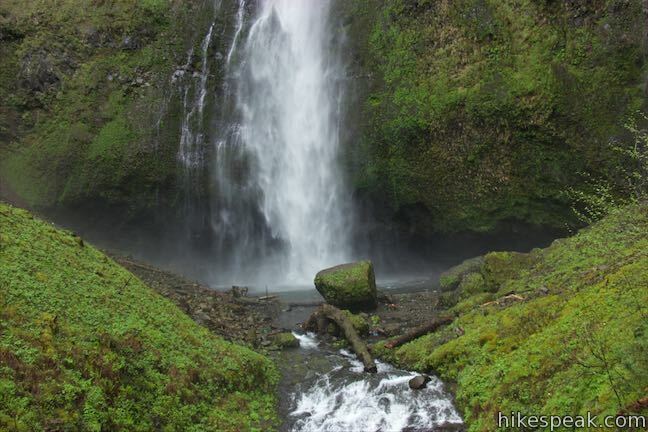 The pavement ends as the trail leads to a canyon filled with a few more waterfall, like Weisendanger Falls, which is 0.35 miles up the trail. 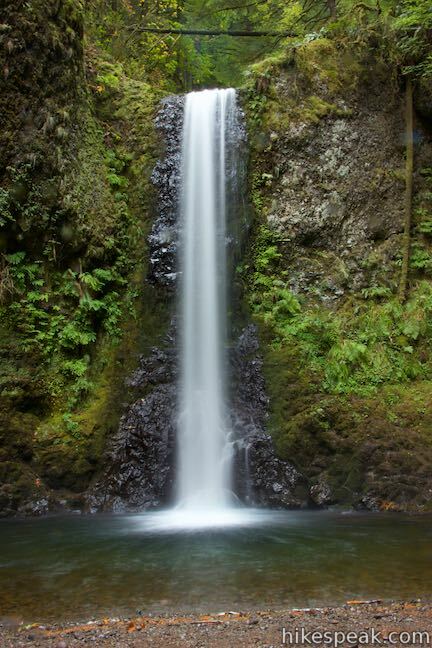 You put in a lot of effort to get to the top of Multnomah Falls, so why not enjoy some of the lovely canyon above? 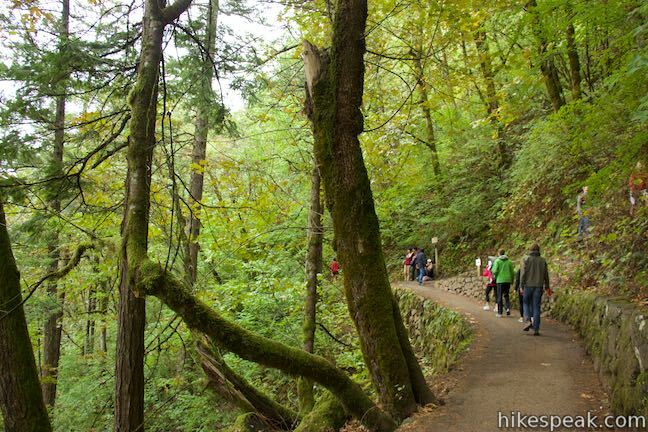 If you’re hiking far above Multnomah Falls, consider hiking Multnomah-Wahkeena Loop, a tremendous waterfall-filled hike that incorporates Larch Mountain Trail. This loop comes down Larch Mountain Trail’s steep paved switchbacks at the end of the loop, after a more moderate ascent. 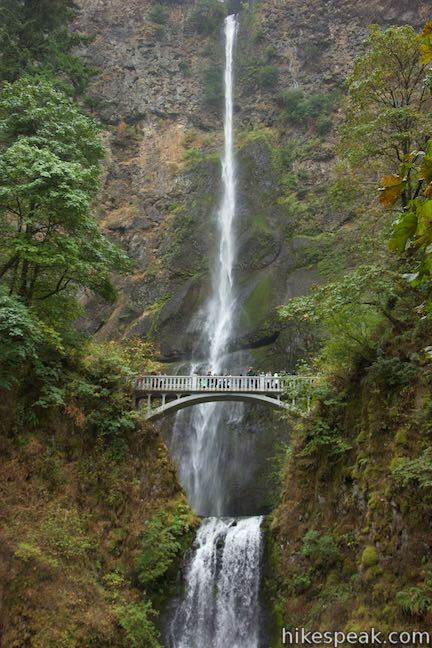 No fee or permit is required to visit Multnomah Falls. Dogs are allowed on leashes. 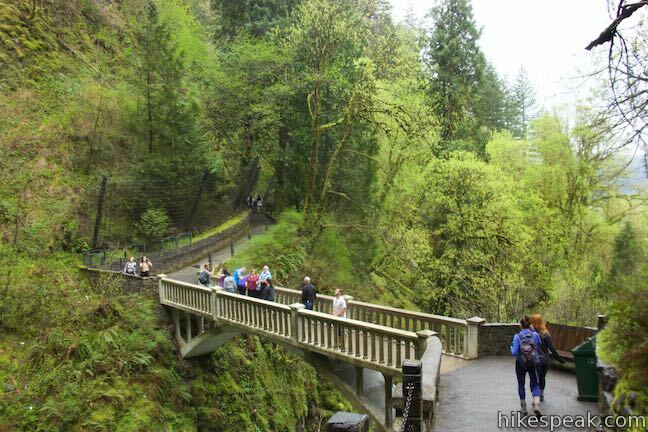 From the viewing area below Multnomah Falls, it is 0.4 miles round trip to Benson Bridge, 2.4 miles round trip to the top of the falls (with 750 feet of elevation change), and 13.6 miles round trip to the top of Larch Mountain. 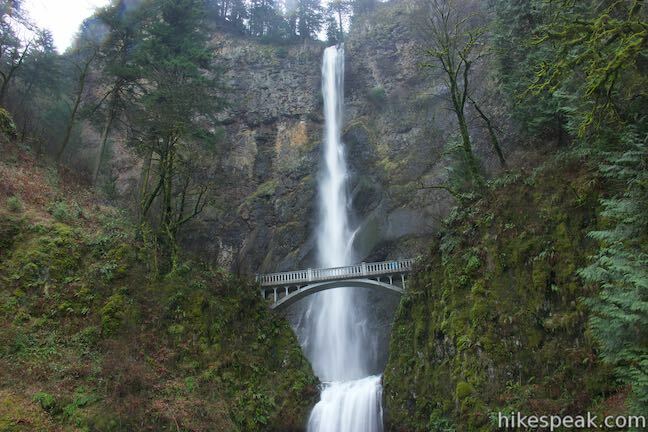 Even if you do not wish to hike a great distance, do not miss Multnomah Falls. It is a magnificent sight. 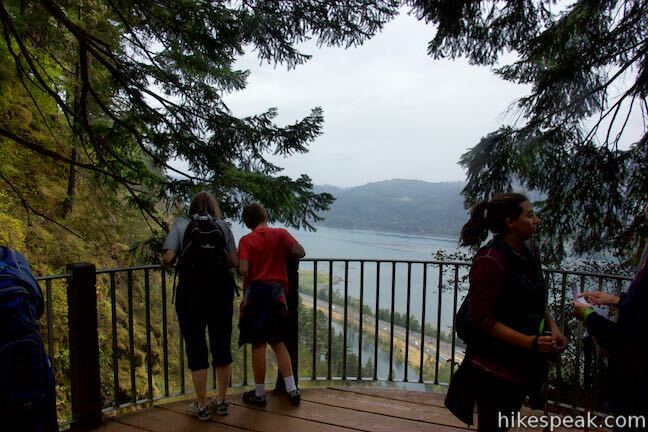 Want a great view over Columbia Rive Gorge? 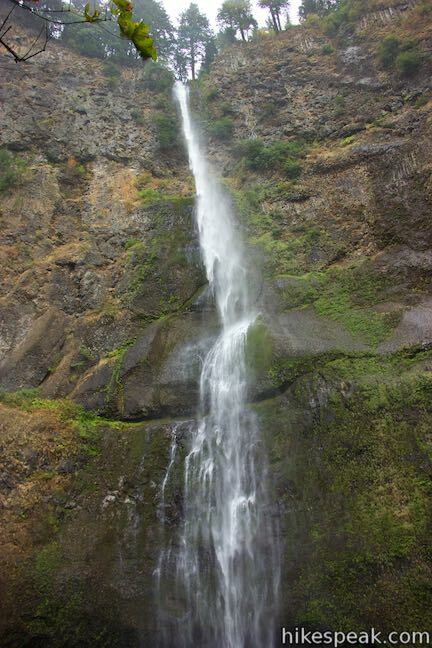 To get to the trailhead: Take Interstate 84 to exit 31 (30 miles east of Portland and 50 miles west of The Dalles). 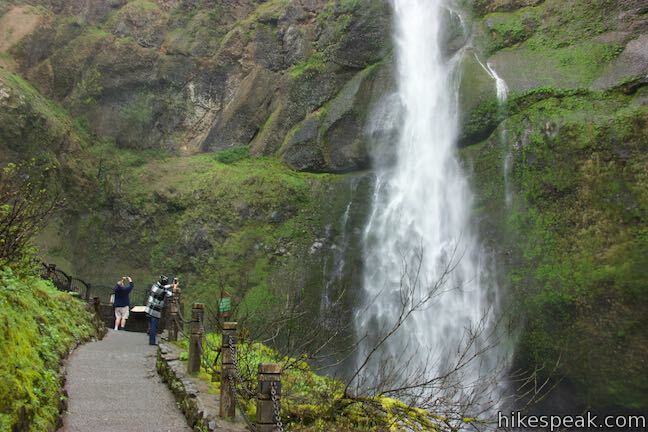 The exit is well marked for Multnomah Falls and leads right to a large parking area. 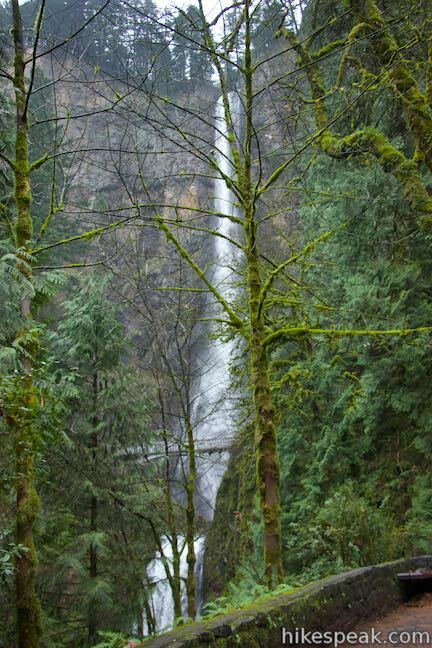 Walk south toward Multnomah Falls, passing below the freeway. 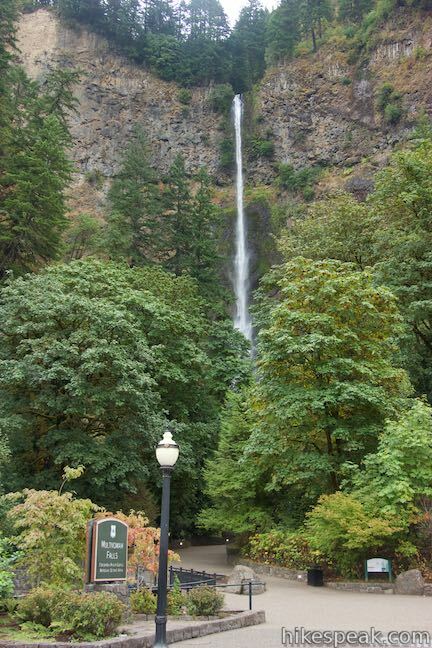 Alternatively, a smaller parking area is located along Historic Columbia River Highway near Multnomah Lodge. 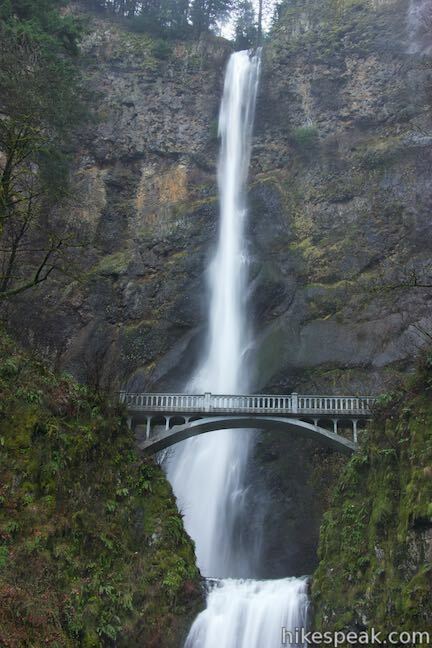 From Portland, take Interstate 84 to exit 28 for Bridal Veil. 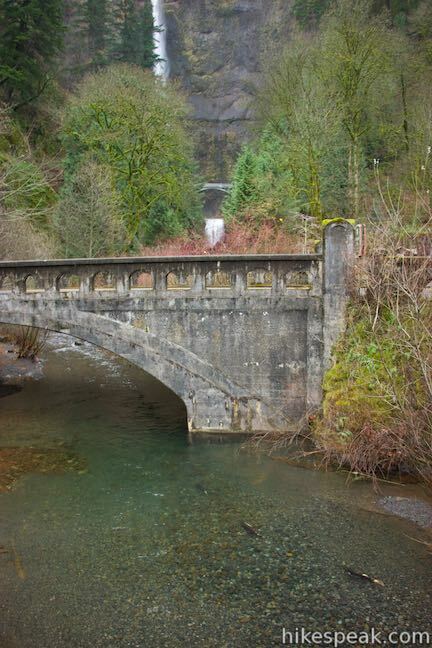 Go east on Bridal Veil Road for a quarter mile to Historic Columbia River Highway. 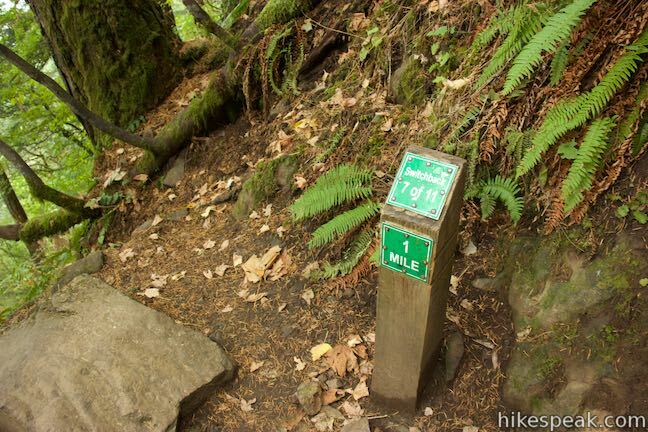 Continue east for 2.9 miles to Multnomah Lodge, where parking is on the left. These photos were taken in December of 2014, September of 2015, and April of 2016. Click to enlarge. 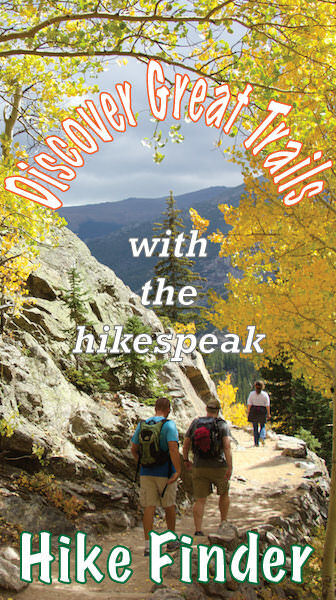 How long is the actual hike? Like hour wise. I overheard someone saying that the bridge is not open right now. Is this true? 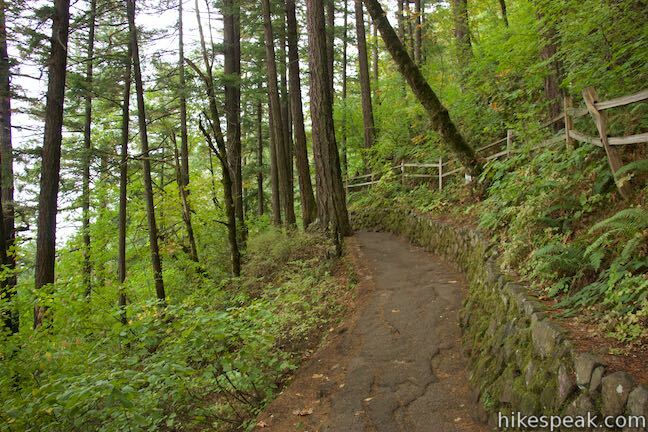 This is a steep hike, but about an hour long. 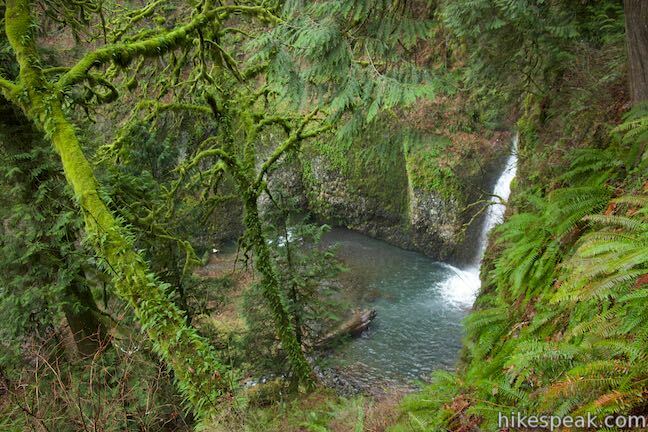 When we went, the falls were closed at the top, so we didn’t get to see the view down into the pool; however, the hike was still worth it to see the river along the top. Our 5 year old made the trail with less effort than we did. 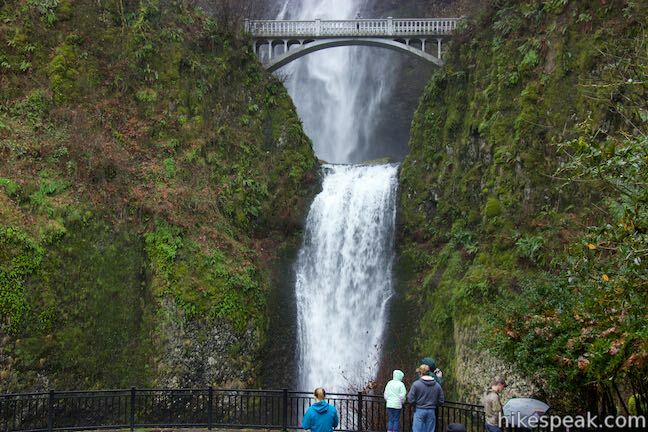 I’m thinking of going to Multnomah falls during New Years week. The thing that concerns me is the weather. Does anyone know what weather is like during this time of year? Hi, around New Years the falls are usually partially frozen. The weather will obviously be cold and the area around the bridge and a little after might be actually quite dangerous because of the frozen water on the ground. Is the place more crowded during July 4th weekend? 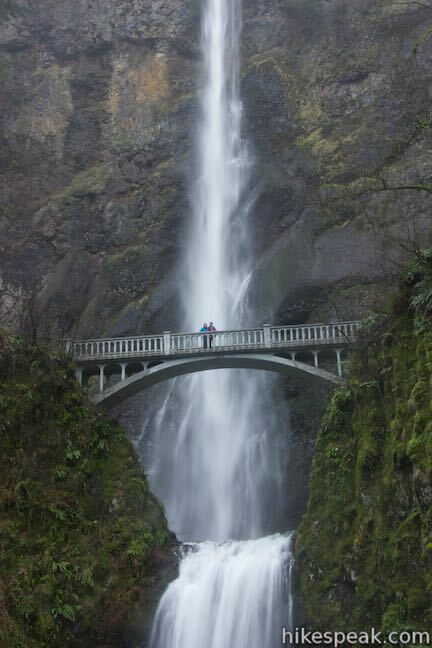 I would expect Multnomah Falls to be very busy any holiday weekend. Arrive early in the day if you can. 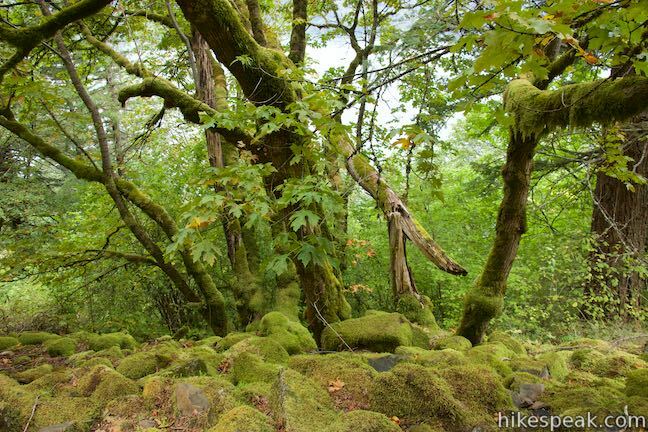 Will I be able to park a truck with a fifth wheel near the trail head? So long as the parking lot isn’t full, you should be able to park. Arrive early. Are these trails wheelchair (scooters) accessible? Thanks! !